We’re a hardworking nation, and many of us have two jobs: employee and parent. Of families with children, 88.2% have one parent who works, and 57.7% of families with children have two working parents, according to U.S. Census Bureau reports. NerdWallet knows that when it comes to their children, parents want what’s best for their families. With this in mind, we partnered with Business Insider to find the best U.S. cities for working parents. Our analysis focused on affordability, child care costs, school quality and the community. ▪ Is the city affordable? Working parents want to live in cities where their hard-earned dollar goes far. We looked at median household incomes in each city and monthly housing costs, including mortgage payments, real estate taxes, insurance costs, utilities, fuel and other bills. Lower costs led to a higher overall score. We weighted affordability as 25% of the overall score. ▪ Is child care affordable? Working parents need affordable child care. We found wide variations in average day care costs for each state in the 2013 study by Child Care Aware of America and the Child Care Resource and Referral. We weighted child care affordability as 25% of the overall score. ▪ Are there high-quality schools in the city? We used ratings from GreatSchools to measure the academic performance of schools. The nonprofit compares standardized test scores from the nation’s public and private schools to the state average to obtain a rating, with a 10 representing the highest score. Higher ratings led to a higher overall score, and we weighted school quality as 25% of the overall score. ▪ Is the city family friendly? Will working parents have a community of other parents? We included the percentage of households with children in the city. This was weighted at 25% of the overall score. ▪ The Southwest takes eight out of the top 10 spots on our list largely because of the relatively low cost of living. ▪ Child care can be a huge cost for parents. 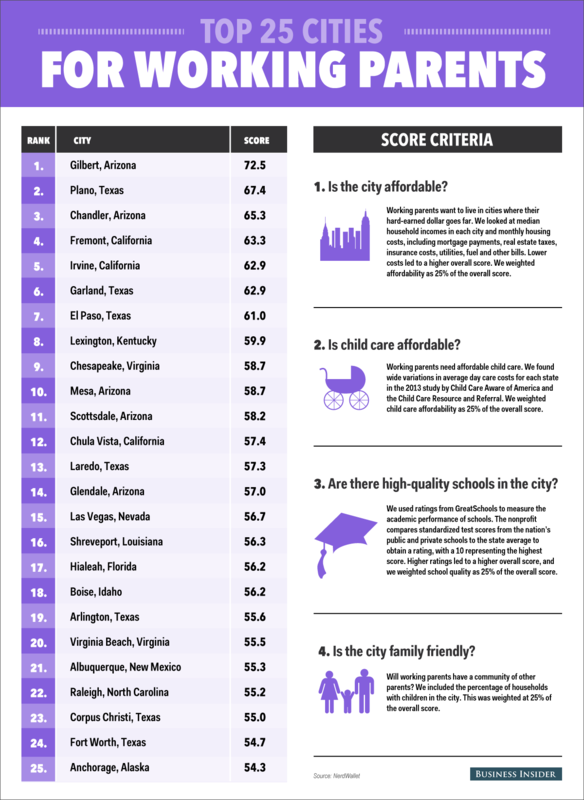 For our top 10 cities, care for an infant costs an average of over $9,000 a year — that’s almost half of the average yearly homeowner costs for the top 10 cities ($21,380). Located near Phoenix, Gilbert has transformed itself from the “Hay Shipping Capital of the World” to a diverse suburban center. With moderate costs and a high median household income, Gilbert offers affordability and also high-quality schools. Almost 77% of households in Gilbert include children. Plano, part of the Dallas-Fort Worth metroplex, is home to the corporate headquarters of Dell Services, Toyota Motors, J.C. Penney and Siemens PLM Software. Plano has a high median income, average child care costs and quality public schools. The second Phoenix suburb to crack our top 10, Chandler’s strong economy is partly due to the presence of Intel, which is the city’s largest employer. Chandler has a low cost of living, which makes life easier for working parents. Incomes are high in the city as well. Fremont is an East Bay city in the San Francisco Bay Area. With its location close to San Jose, the heart of Silicon Valley, Fremont benefits from high salaries in the tech sector to offset the high housing costs. Families here can enjoy easy access to nature at Fremont’s Central Park and the Don Edwards San Francisco Bay National Wildlife Refuge. Children live in about 4 out of every 5 households. In Irvine, families have access to top-notch public schools and many parks. Irvine’s high incomes and great public schools earn it a place on our list—the city received a perfect score from GreatSchools. This city, also part of the Dallas-Fort Worth metroplex, offers families access to over 2,880 acres of parkland. Garland residents enjoy a low cost of living in a place where 77.1% of households include children. El Paso has a strong military presence as the home of Fort Bliss and the William Beaumont Army Medical Center. El Paso’s low costs allow military and other working parents to live comfortably. The “Horse Capital of the World” offers more than the Kentucky Horse Park, the site of major equestrian events. Lexington’s economy is strong in manufacturing and technology as well, and companies such as Xerox, IBM and Lockheed Martin are major employers in the city. In Lexington, working parents enjoy the lowest child care costs in our top 10 as well as quality schools. Parents in Chesapeake benefit from the low cost of living and high salaries for workers. Chesapeake is home to two Navy bases as well as protected wetlands. Many residents in this Phoenix suburb work in health care, a large local employer. Mesa’s low cost of living and quality schools earned it a spot in our top 10. Median income and selected monthly owner costs (total 25% of overall score): 2009-2012 American Community Survey 3-Year Estimates. Day care cost estimates (25% of the overall score): 2013 study by Child Care Aware of America and the Child Care Resource and Referral. School data (25% of overall score) Greatschools.org ratings for each city. Percentage of households with children from the U.S. Census Bureau. We looked at the largest U.S. cities for this analysis, but excluded those where key data wasn’t available. We analyzed 100 cities.